You may have seen artillery fungus (Sphaerobolus stellatus) and not even know it. The fungus resembles scaly dirt or mud spots and is found on light colored housing, cars and exterior surfaces. It is also found in manure and bark mulches. The name is derived from the Greek for “spear thrower” because of its ability to propel spores at quite some distance. Learn how to get rid of artillery fungus and what you can do to prevent the spotting on your property. Those annoying black spots that creep up your siding or splash along the side of your car may not be mud spatters but artillery fungus. What is artillery fungus? It is Sphaerobolus, a common fungus that sticks firmly to light or white colored surfaces and resembles spots of tar. Its adhesion properties are legendary and the spots can be difficult or even impossible to remove without damaging the surface. This common fungus is often found in bark mulch, especially hardwood mulch, too. There is some suggestion that artillery fungus in mulch such as cedar and pine bark nuggets may occur less frequently than hardwood. It is most prevalent on the north side of a building and shoots spores towards bright light. This fungus produces a cup-shaped peridiole which contains fruiting bodies. When the cup fills with water, it inverts and shoots out the fruiting bodies. These are most obvious when attached to a light colored surface, such as white housing siding. Once they attach, the fungus is very difficult to get off. Is artillery fungus harmful? It does no real damage to surfaces and is not a toxic mold. It is, however, unsightly and difficult to remove. The best conditions for the formation of the spores are cool, moist and shady conditions. This is why the spores are more noticeable on the north side of a house. They are more prevalent on light colored structures because the peridiole shoots the fruiting bodies towards light and light reflects best off of these lighter surfaces. 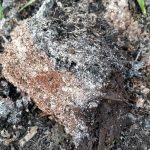 It is recommended that old mulch is raked to expose the spores to light and dry out the material, or 3 inches of new mulch added over the old to suffocate the spores of artillery fungus in mulch. There is no recommended artillery fungus treatment. 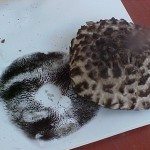 If the spores are fresh, sometimes soap and water with a scrub brush will remove a bit of the fungus. You can power wash them off of vinyl siding but such methods can be damaging to cars and wood siding. There is no fungicide registered as an artillery fungus treatment. There is research to suggest that blending mushroom compost at a rate of 40% with landscape mulch can suppress the spores. Also, the use of gravel or plastic mulch will not cause the formation of the spores. To kill the spores in lighter areas, cover the zone with black plastic and allow the sun to cook the spores out of the bark. Read more articles about Fungus & Lichen.